Our tubular rear upper control arms for the 1979-2004 Ford Mustang and Fox Body cars outperform the flexible, stamped-steel arms and soft rubber bushings that come from the factory. Eliminate wheel hop and increase traction with an easy bolt on installation. All ends are fitted with grease fittings for easy lubrication of the fluted polyurethane bushings. Check out all of our performance suspension components for the 1979-2004 Ford Mustang and Fox Body cars by clicking here! These combo ended adjustable rear lower control arms will wipe out most bind, yet keep the road noise increase minimal for a street driven car. The Del-Sphere pivot joints provide for “bind-free” handling performance. They will work best when combined with our SKU# M4-605 Del-Sphere pivot jointed adjustable rear upper control arms. Fitment Note: These adjustable LCAs do NOT have any provisions for mounting a factory style rear sway bar. 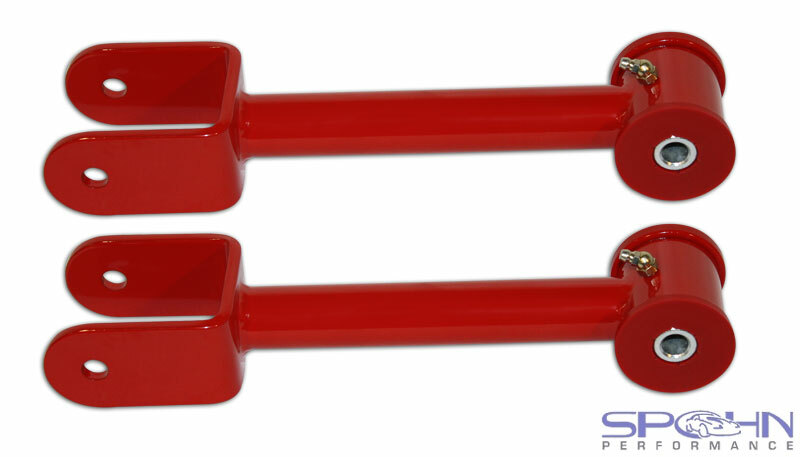 These are race inspired rear lower control arms that should be used in conjunction with an aftermarket rear sway bar or anti-roll bar that does not mount to the rear lower control arms. Our tubular rear lower control arms for the 1979-2004 Ford Mustang and Fox Body cars outperform the flexible, stamped-steel arms and soft rubber bushings that come from the factory. 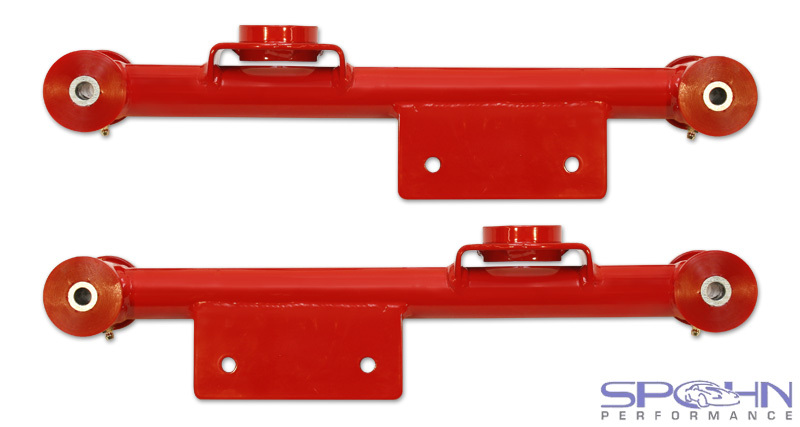 Available powder coated in bright red or gloss black for a brilliant and durable finish. Do you have a Dodge Ram 4×4 truck with aggressive tires? 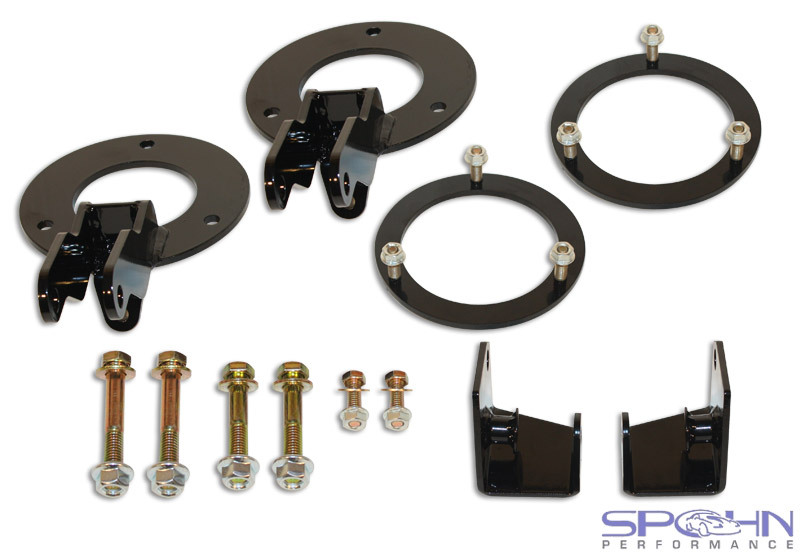 Spohn Performance’s dual front shock mounting kit is ideal to tame your beast. Dual front shock kits help to distribute the workload over two shocks for improved on and off road performance. These dual front shock kits serve up added stability for a more controlled ride when taking on those less traveled trails and grouping shocks lowers shock temperature and reduces shock fade. 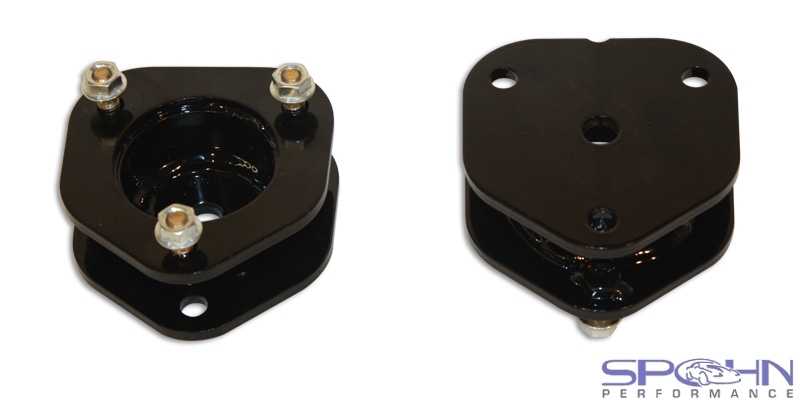 Installing our dual front shock kit is a simple 100% bolt in installation, no welding or cutting is required. This is the dual front shock mounting kit. You can choose to purchase the kit with or without shocks. Be advised that the shocks required to work as a second shock with our mounting kit are not the same length or type as the factory location front shock. We highly suggest you purchase the shocks along with the mounting kit so you’re sure to have the proper shocks to install. Check out all of our performance suspension components for the 2003-2012 Dodge Ram by clicking here! When searching for a front leveling kit for your Dodge Ram 1500 4×4 or Dakota 4×4 and 4×2 trucks you’ll find a few choices, some cheaper in cost than these. But as with anything, you get what you pay for. The low cost alternatives on the market are lacking in build quality to say the least. The Spohn Performance front leveling kit for the Dodge Ram and Dakota is American made from DOM tubing and 1/4″ CNC laser cut plate that we completely deburr and chamfer. They are then assembled and jig welded by our skilled craftsmen right here in our Pennsylvania based facility…. and it shows. If you care about the quality of the parts you put on your truck, then look no further! This 2″ front leveling kit is designed to lift only the front of the Dodge Ram 1500 4×4 and Dakota 4×2 and 4×4 trucks to make the front level with the rear. This provides more fender clearance for larger tires and makes for a nicer stance. It is engineered to mount above the factory front struts to maintain factory ride quality and strut travel. Factory struts can be retained. This kit is a 100% bolt in installation with no drilling or welding required. Fitment Note: Will NOT fit the 2003-2005 Dodge Ram 1500 4×4 that had a torsion bar front suspension. Will NOT fit on any Mega Cab trucks. Click here to view all of our performance suspension components for the 2003+ Dodge Ram trucks.